View looking across Archibald Lake toward the island on the right, and the mainland in the distance on a cloudy day. Three very tall trees are standing at the shoreline of the island next to the Wheeler frame house with porch, also known as The Ark, on the right. Water lilies are floating in the lake in front of the house. 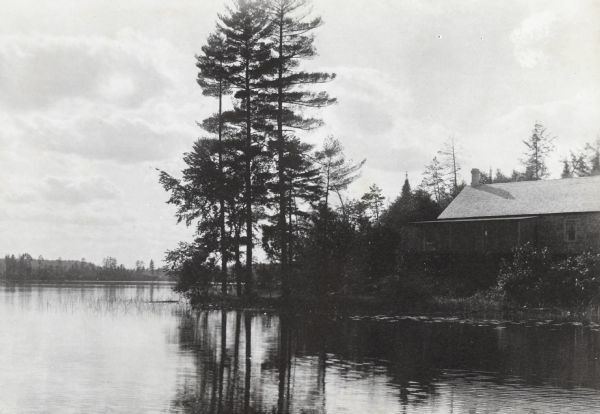 The Wheeler frame house on the Island at Archibald Lake was commissioned by Anna Holt Wheeler, the sister of W.A. Holt. This house was known as the Ark. "When it was first built it stood on the waters edge, and this, plus some Biblical imagination, gave it its name." Source: Holt, Constance W. & Holt Jr., Donald R.(1968). "Place Names." This unpublished manuscript is part of Holt Family Albums collection.